Feast in honor of the Blessed Virgin's espousal to Saint Joseph. It dates from 1517 when it was granted to the nuns of the Annunciation by Pope Leo X with nine other Masses in honor of Our Lady. Adopted by many religious orders and dioceses, it was observed for a time by nearly the whole Church, but is no longer in the Calendar. It is the subject of a famous painting by Raphael and Viterbo. Daughter of Guido Bianchi Porro and Elsa Giammarchi, the second of six children. Afflicted with poliomyelitis at an early age, leaving her with a crippled left leg and a need to wear a brace to prevent her spine from deforming. A clever and happy child, she began keeping a diary at age five; it became a lifelong record of her faith and the way she carried the cross of her disability. Much of her primary education was provided by Ursulines. In her teens she began to lose her hearing, and her overall health continued to deterioate. At age 17 she enrolled in the University of Milan, Italy with a plan to study physics, but later changed to medicine. Some teachers objected to having a pre-med student who was so deaf that had to have written questions during an oral eximation, but Benedetta was an excellent student. In 1957 her studies had reached a point that she was able to diagnose herself; she had Recklinghausen Disease­-Neuro-Fibromatosis which leads to paralysis of the nervous system. She had surgery in 1958 to treat part of the condition, but it was of little benefit, and left the left side of her face paralysed. She continued her studies, but in 1959 she began losing the sense of touch, taste and smell, was completely deaf, and had to give up the idea of a medical career. Benedetta had further surgery in August 1959; it left both legs paralyzed, and the young woman wheelchair bound. She then turned her sick room into a center of support and communication for others. Her friends from medical school were frequent visitors, and she began correspondences; in person or in print she was uniformly optimistic about life and the love of God. Benedetta and her family visited Lourdes in May 1962 in search of a cure; a paralyzed girl lying next to her was completely healed, but there was no change for Benedetta. In Milan on 27 February 1963 Benedetta had another operation; it left her blind. She could barely speak, and could only move her right hand. However, the number of her visitors increased as word of her holiness and her gentle understanding of to love God even these circumstances. On 24 June 1963 she went again to Lourdes; as her family waited for her to be healed, she received her own miracle – the understanding that she would not change a thing about her condition. Her bed became the pulpit from which Benedetta 'preached without preaching' lessons of patience, humility, fortitude, resignation to God's will, the value of the Cross endured with Christ and for Christ. – Father Francis Xavier Grasso, S.J. Wandering missionary who made pilgrimages to tombs of saints and martyrs throughout Gaul and northern Italy, preaching to those he met on the way. Foster-sister of Saint Agnes of Rome. Catechumen. While on her way to pray at Saint Agnes's grave a few days after her sister's martyrdom, she was confronted by an angry mob of pagans. Emerentiana professed her Christianity and her relationship to Agnes. Martyr. Born to the Spanish nobility. Nephew of Saint Eugene of Toledo. Studied at Seville, Spain under Saint Isidore of Seville. Monk at Agli (Agalia) on the River Tagus near Toledo, Spain while still a young man. Abbot at Agli. Attended the Council of Toledo in 653 and 655. 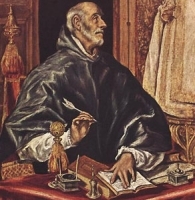 Archbishop of Toledo in 657. Responsible for the unification of the Spanish liturgy. Noted writer, especially on Our Lady; only four of his works have survived. Reported to have received an apparition of the Virgin Mary during which she presented him with a chalice. Nearly blind. Pious youth, given to severe, self-imposed austerities. She attracted followers, and founded a religious community of men and women. She wrote a separate rule for the community, but the group did not survive her death, the members joining other, established groups. Layman catechist in the the apostolic vicariate of Korea. Assistant to Saint Lawrence Imbert. Turned his home into a safe-house for Christians hiding from official persecutions, for which he was shot, arrested and finally executed. Martyr. Born a rich pagan, Dositheus spent a wild and worldly youth. During a visit to Jerusalem he was so impressed by Christians, by an horrific image of the torments of hell, and by the message of a woman he saw in a vision, he converted, and became a monk at Gaza. 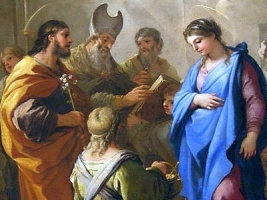 He was placed under the direction of Saint Dorotheus the Younger, who had a long and steady struggle to teach Dositheus discipline, and take him from his worldly ways. Dositheus learned, changed, and became known for his gentle and supportive ways with the sick. When he became too ill to care for other sick people, he prayed that God would relieve him of his life, and soon after, he died quietly in his sleep. Arrested and tortured for his faith by order of Arrian, governor of Egypt, during the persecutions of Diocletian. While Asclas was in prison, Arrian had reason to cross the River Nile on government business - but found he was absolutely unable to leave the water's edge. Asclas sent word that the governor would never be able to cross the river until he acknowledged Christ in writing. Arrian wrote out the statement, and was promptly able to leave the river bank. He crossed the Nile, and the moment he was on the other side, he ordered that Asclas be tortured and drowned. Martyr. Abused by a jealous step-mother for her kindness to the poor, Lufthild left home young to live as an often-homeless hermit in and around Cologne, Germany. Spiritual student of Saint Felician of Foligno. Nun, receiving the veil from Saint Felician. During a period of persecution, Felician was imprisoned; when she visited him, Messalina was suspected of being a Christian. She was arrested, put on trial and ordered to sacrifice to pagan gods; she refused. Martyr. Old Testament patriarch. Second son of Adam and Eve, slain by his brother Cain because the latter's oblation was not accepted favourably by God as was Abel's. For his death in this way he is regarded as a type of Our Saviour. His death symbolizes, too, the bloody sacrifice of the Cross and the unbloody one of the altar. He is mentioned in the Canon of the Mass, and his name holds first place in the Litany for the Dying. Adult convert to Christianity, baptized by Saint Clement of Ancyra. Deacon. Evangelized in Ancyra (in modern Turkey) with Saint Clement, and was martyred with him. Mercedarian priest. With Blessed Juan Solorzano and Venerable Jorge of Seville, Blessed Juan accompanied Christopher Columbus on his second voyage to the Americas, and was the first celebrate Mass in South America. Prince. Relative of King Anna of East Anglia, England. Brother of Saint Etheldreda. Confessor of the faith. Fourth-century bishop of Ancyra in Galatia, Asia Minor. Martyred in the persecutions of Diocletian and Maximinian. Monk. Abbot of the monastery of Saint Mairé in France, c.587. He supported monastic expansion and evangelization in his region. Monk under Saint Hierlug. Abbot-bishop of the monastery at Lismore, Ireland in 698. During his leadership, Lismore's fame for holiness and scholarship reached its peak. Forced into exile in Italy for his opposition to the Arian heresy. Bishop of Teano, Italy in 346. Sixth century hermit in the Valeria (modern Abruzzo), Italy. Married to Saint Aquila. Martyr. Married to Saint Severian. Martyr. Fourth-century hermit on Mount Coryphe near Antioch, Syria.